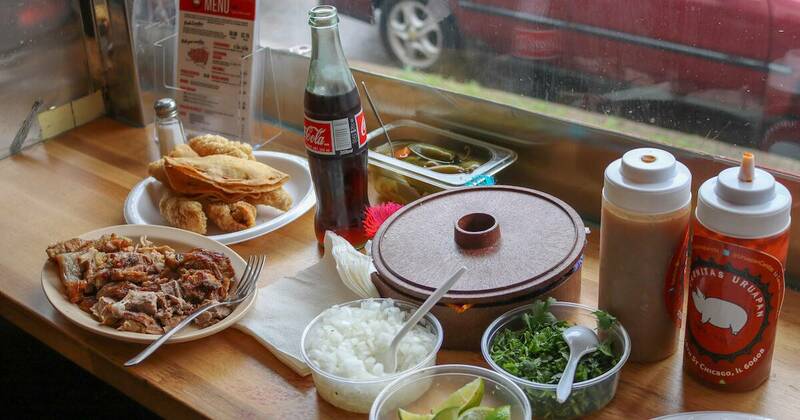 Marcos Carbajal’s Chicago restaurant is known for their carnitas, but seared into the crispy, tender bits of pork that brings generations of Mexicans to his tiny restaurant is something that can’t be replicated by any one recipe or ingredient—memory. Two servers chop carnitas and package to-go orders inside Carnitas Uruapan, a Mexican carnitas restaurant in Chicago’s Pilsen neighborhood. Photo by Brian Nordli. 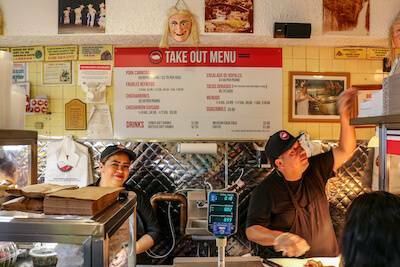 Carbajal’s father, Inocencio “El Guero” Carbajal, opened Las Carnitas Uruapan 43 years ago in Chicago’s Pilsen neighborhood, the heart of the city’s Mexican community. He grew up making carnitas with his father and uncle in the Michoacán city of Uruapan. They used the whole hog from snout to tail and seared it first to give it its signature crispy outside and tender inside. Marcos Carbajal’s father brought those traditions to Chicago. 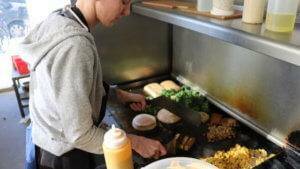 Today, he uses the same cooking style and often offers samples of meat to any customer who asks. 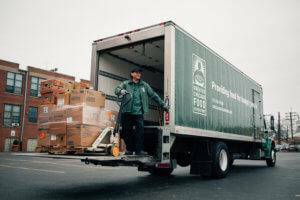 “My Dad comes from a culture and knows that you’re not just selling food—you gotta sell some of yourself as well,” Marcos Carbajal said. On weekends, the place becomes a version of the markets where Marcos Carbajal’s father once sold carnitas as a child. 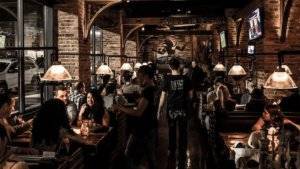 The smoky smell of seared pork drifts to the nearby train station, and the restaurant bustles with loud Mexican music, laughter and people speaking Spanish, Marcos Carbajal said. 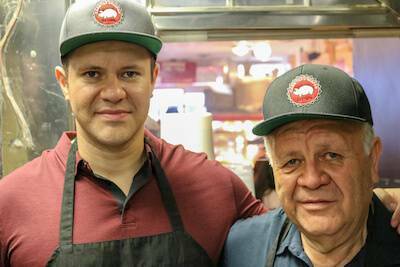 Marcos Carbajal, left, and his father Inocencio Carbajal stand in the kitchen of their Chicago restaurant, Carnitas Uruapan. Inocencio Carbajal opened the restaurant 43 years ago in Chicago’s Pilsen neighborhood and specializes in Uruapan-style carnitas. Photo by Brian Nordli. This is where Marcos Carbajal, 34, grew up. It’s where he snuck into the kitchen unpermitted at age 5 to help the cooks, did his homework at the tables, bussed and worked over his high school summers. It’s also his connection to his heritage. Today he co-owns the restaurant with his father. Food has the power to transport a person through time and place. The sights, the smells, the taste can bring a person back to their roots, back to a tradition, a celebration, a moment. For others, a dish made with care can be like a passport into a different country, without the airfare. It just takes knowing where to look. The Carbajals’ restaurant is not the only one in Chicago serving up heaping portions of Mexican culture, history and nostalgia. The Chicago metropolitan area is home to the second-largest population of Mexicans in the U.S., with the largest populations in the Pilsen, Little Village and Back of the Yards neighborhoods, said Cesareo Moreno, chief curator at the National Museum of Mexican Art in Chicago. At the heart of these communities is food. In Pilsen, eaters can find heaping portions of carnitas, bowls of menudo and white posole, and tender carne asada tacos. Each dish carries with it the traditions of its hometown, from Michoacán to Jalisco to Zacatecas to Durango. Meanwhile, grocery stores are stocked with ingredients special to Mexico, like dried chiles, cremeria and mole. They not only fill bellies but act as touchstones of familiarity in a foreign land. 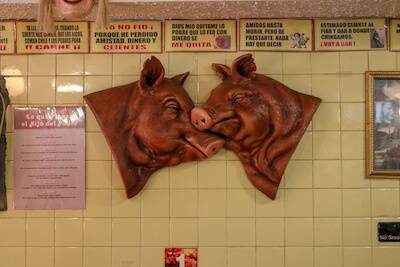 Two pigs decorate the wall inside Las Carnitas Uruapan. Photo by Brian Nordli. Chicago’s vibrant Mexican food culture is featured in new PBS show “No Passport Required.” In the Chicago episode, host and chef Marcus Samuelsson tours Carnitas Uruapan and talks with the chefs. He also made Oaxaca-style green mole with chef Diana Dávila of Mi Tocaya and experimental tamales with chef Carlos Gaytan of Mexique. 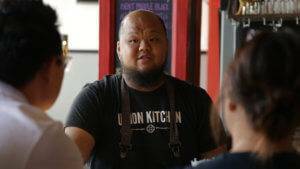 But what makes Chicago’s Mexican food unique is that the food hasn’t been influenced by outside ingredients as it has in other places, like Texas’ Tex Mex, Moreno said. Instead, the chefs remain true to the family recipes they grew up eating. Discovering another culture’s food can be an exciting way to gain insight into its traditions and history. However, finding those culturally authentic restaurants, like Las Carnitas Uruapan, can be a challenge if you aren’t from the community. Jean Nihoul, curatorial associate at the Museum of Food and Drink in New York, wrestled with this question as he selected restaurants that represented New York’s Chinatown. It can be difficult to know what makes a place “authentic,” he said. Just because a chef is not from that culture or the restaurant is expensive doesn’t make it inauthentic, he added. A half-pound order of carnitas is prepared inside Carnitas Uruapan. Photo by Brian Nordli. In fact, he urges people to look beyond the pricepoint, which is a way of “viewing another culture as lesser than ours.” Instead, all that matters is if the food is true to the tradition. 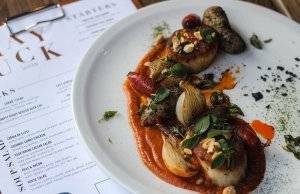 Still, there are a few ways to find culturally authentic restaurants. Like all good hunts, Nihoul suggests starting with the internet first and looking for neighborhoods where a certain culture is most prevalent. 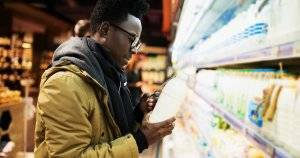 From there, it’s best to walk around and look for cues, like foreign language being spoken or customers from that culture. He also keeps an eye on where police officers, fire fighters and cab drivers eat in a neighborhood. But most important, keep an open mind. There’s a world of food out there ready to take you on a journey. Watch “No Passport Required” on PBS. Check your local station’s schedule for broadcast dates and times or watch online at PBS.org. Brian Nordli is a freelance journalist based in Chicago, where he writes about social issues, immigration and culture. Before returning to his hometown, he worked at a newspaper in Las Vegas covering crime, education and the city’s desert denizens. He recently spent more than a year teaching English in South Korea and traveling Europe and Asia. He hasn’t been able to shake his craving for kimchi since.